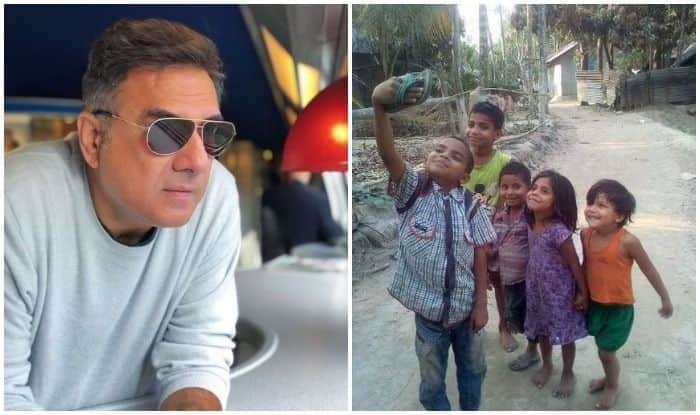 In the shared picture, a bunch of kids are seen posing for their friend who holds up his chappal in selfie-camera position. They say one happiness scatters a thousand sorrows and actor Boman Irani makes sure to sprinkle some of it all over the internet with his latest Instagram post. Freezing a frame that reeks with innocence, actor Boman Irani gave us some happy food for thought as his subjects egged us to find happiness in the little things. In the shared picture, a bunch of kids are seen posing for their friend who holds up a slipper in selfie-camera position. While all the four kids are bare-feet, one among them is seen wearing a green chappal as the other slipper from the pair is offered to his photographer friend to use as a camera for their naive game. As the fivesome smile ear to ear, Boman captured the moment and sharing it on his Instagram handle, captioned it, ““You’re only as happy as you choose to be”. A saying that holds true for one and all!! And I’m sure this selfie deserves more likes than most.
. #PictureOfTheDay #Happy #Selfie #Kids #InstaGood #InstaPic” (sic). On the professional front, Boman, who has a kitty full of upcoming movies, has been recently roped in the upcoming biopic of Prime Minister Narendra Modi, with actor Vivek Oberoi essaying the titular role. Ecstatic that to join the cast of the biopic, Boman had earlier said in an interview that it was a great start for his New Year.